What Are School Programs Like in China? Can Foreigners Go to Primary or Secondary School in China? Can Foreigners Go to College or University in China? What If I Don't Speak Chinese? China can be a great place to learn depending on what topic you are studying, what teaching methods work best for you or your personal interests. Whether you're thinking of going to school in China, considering enrolling your child in a Chinese school, or just curious to know more, here are answers to frequently asked questions about school programs in China, China's education methods, and enrolling in school in China. Education is required and free for Chinese citizens age 6 to 15 though parents must pay fees for books and uniforms. Chinese children all get a primary and middle school public education. Each class averages 35 students. After middle school, parents must pay for public high school. The majority of families in cities can afford the fees, but in rural parts of China, many students stop their education at age 15. For the wealthy, there is a growing number of private schools in China as well as dozens of international private schools. In high school, Chinese students begin preparing for the competitive 高考 (gaokao, National University Entrance Examinations). Somewhat similar to the SAT for American students, seniors take this test in the summer. 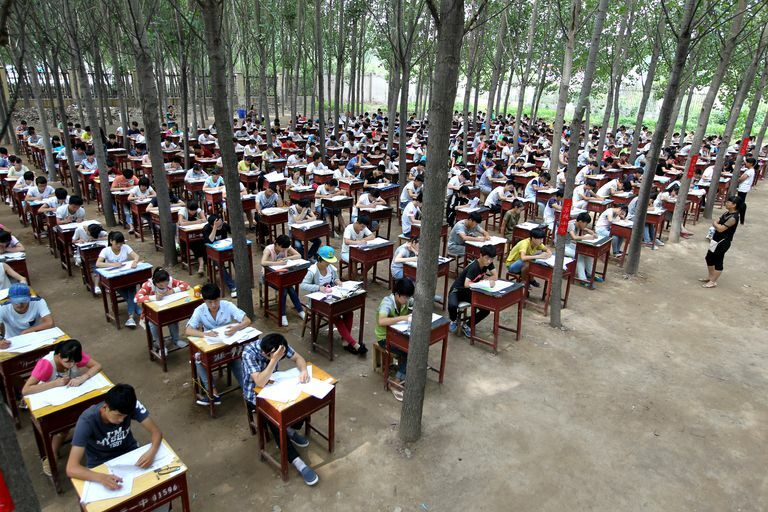 The results determine which Chinese university test-takers will attend the following year. Chinese students attend classes five or six days a week from the early morning (about 7 am) to early evening (4 pm or later). On Saturdays, many schools hold required morning classes in science and math. Many students also attend 補習班 (buxiban), or cram school, in the evening and on weekends. Much like tutoring in the West, schools in China offer additional Chinese, English, science and math classes and one-on-one tutoring. Aside from math and science, students take Chinese, English, history, literature, music, art, and physical education. China’s teaching methodology differs from Western education methodology. Rote memorization is emphasized and there is a heavier focus on math, science, and Chinese studies. It is also standard practice for classes to be complemented with extensive test prep throughout middle school, junior high school, and high school for college entrance exams. Schools in China have after-school activities, like sports and music lessons, but these activities are not as extensive as those found in international schools and schools in the West. For example, while team sports are becoming more popular, competition among schools is more like an intramural team sports system rather than a competitive system. Schools in China have a break lasting for several days or a week during China’s national holiday at the beginning of October. During Spring Festival in mid-January or mid-February, depending on the lunar calendar, students have one to three weeks off. The next break is for China’s labor holiday, which occurs during the first few days of May. Finally, students have a summer vacation which is much shorter than in the US. Summer vacation typically begins in mid-July though some schools start their vacations in June. The vacation lasts for approximately one month. While most international schools will only accept Chinese students who hold a foreign passport, Chinese public schools are required by law to accept children of legal foreign residents. Admissions requirements vary but most schools require an admissions application, health records, passport, visa information, and previous school records. Some, like nurseries and kindergartens, require a birth certificate. Others require recommendation letters, assessments, on-campus interviews, entrance exams and language requirements. Students who cannot speak Mandarin are usually held back a few grades and usually start in first grade until their language skills improve. All classes except English are taught entirely in Chinese. Going to local school in China has become a popular choice for expat families who live in China but can’t afford the high price of international schools. The admissions materials at local schools are typically in Chinese and there’s little support for families and students who do not speak Chinese. Schools in Beijing that accept foreign students include Fangcaodi Primary School (芳草地小学) and The High School Affiliated to Renmin University of China Beijing Ritan High School (人大附中). There are over 70 schools approved by China’s Ministry of Education to provide foreign instruction. Unlike local children, foreigners must pay a yearly tuition which varies but starts at about 28,000RMB. Various programs are offered at schools in China for foreigners. An application, copies of visa and passport, school records, physical exam, photo, and proof of language proficiency are all most students need to gain acceptance to undergraduate and graduate programs at schools in China. Chinese language proficiency is typically demonstrated by taking the Hanyu Shuiping Kaoshi (HSK exam). Most schools require a score of level 6 (on a scale of 1 to 11) to enter undergraduate and graduate programs. Additionally, a perk for foreigners is that they are exempt from the gaokao. Many prospective students consider applying for scholarships to study at schools in China. Foreign students pay more in tuition than local students, but the fees are generally much less than students would pay in the United States or Europe. Tuition starts at 23,000RMB annually. Scholarships are available for foreigners. The most common scholarship is given by the Ministry of Education’s China Scholarship Council and the Chinese government. The Chinese government also awards the HSK Winner Scholarships for the top HSK test-scorers overseas. One scholarship is awarded per country where the test is administered. There are programs for those who do not speak Chinese. From Mandarin language learning to Chinese medicine to a Master of Business Administration, foreigners can study a range of subjects at schools in China, including Beijing and Shanghai, without speaking a word of Mandarin. Programs range from a few weeks to two years or more. The application process is quite simple and consists of an application, a copy of visa, passport, school records or diploma, physical exam, and photo.